For a place that many people say is great for doing nothing, there are a lot of things to do on Edisto Island should you ever want to come in off the beach. To begin with, drive down Highway 174 like youre going into Charleston, but stop at the McKinley Washington Bridge. If youre leaving the island, the parking area is to the left right before the bridge. There is a boat ramp and dock there for anyone looking to take a trip through Edistos backwaters or along the Intracoastal Waterway. In addition, there is a picnic table available for anyone who decides to stay awhile and have lunch or do some fishing. This out of the way location is filled with the sounds of the wind blowing across the water and marsh grass, squawks of snowy egrets hunting for fish, and splashes of the dolphins swimming. Its an area that begs to be photographed especially during sunrise and sunset when the sun turns the sky into a kaleidoscope of pink, orange, and red. For all those whove been coming out to Edisto for decades, remnants of the old Dawhoo bridge can be seen jutting up from the pluff mud  and for those of you who never got to experience the rickety old Dawhoo bridge just know youre lucky to have never wondered if youd make it to the island or end up in the murky waters below. Another activity vacationers can do while visiting Edisto Island is stop at the various roadside open air markets like Kings Market on Highway 174 and George and Pinks Market on Eddingsville Beach Road (right off of Highway 174 next to Mains Market). Both of these establishments offer fresh fruit and vegetables that are locally grown. They also offer floral arrangements, boiled peanuts, casseroles, and handmade crafts. (Try an Edisto tomato from either of these markets and youll almost wish you never had because youll never find a better tomato anywhere else). George and Pinks market is chock full of photo ops with all the chickens running around and wooly bear-like dogs on the property. Youre almost guaranteed to see Duke (one of the wooly dogs) sleeping on the porch chair in front of the market or in a nice hole dug out alongside the house to keep cool. 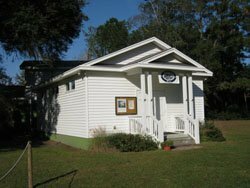 Theres also the Edisto Museum right off of Highway 174 on Chisolm Plantation Road. The museum provides a wealth of information about the islands past and has a giftshop with local and regional artwork and crafts. In addition, two slave cabins were recently brought to the premises and provide a glimpse of what pre-antebellum South Carolina was like. The Edisto Bookstore on Highway 174 located in the Edisto Center shopping plaza. This store feature new, used, and local books and maps, and is kid-friendly. In addition to books, greeting cards, postcards, and other stationary items are for sale. Shopping enthusiasts can hit up the gift shops in the Edisto Center on Highway 174 next to the post office, visit the giftshop in the Edistonian plaza (its much more than just a gas station), browse through the arts and crafts at With These Hands Gallery next to the Old Post Office restaurant, and the Pink Pirate on the corner of Oyster Factory Road and Highway 174. The island is full of things to do and with just one main road (Highway 174) theyre all easy to find. So the next time youre in the area, hop in the car, roll the windows down, and cruise up the road to see all that the island has to offer. I spend my time around Bay Point or on the wide beach at White Cap Street flying kites. The island has some great walking and bike trails and it is easy to get from one place to another. Views across the marshland at Big Bay Creek cannot be topped! And you must spend a day at Botany Bay Plantation! I love to spend all day on the beach and then engage in some porch sitting at night enjoying the breeze. Also, at least one meal at the Sea Cow is mandatory during the visit! Can't wait for my first trip in 2012! I love to go and spend the week at Edisto with my children, their spouses and grandchildren. I absolutely love spending time with the grands looking for shells, sea creatures hiding in the rocks and building sand sculptures and sand castles with them! (never mind that I have no fingernails left after this and they are so short they hurt!!) Of course no trip is complete without the daily trip to the PIG we dig!! I was born and raised in California and spent many days at the beach. Edisto is a perfect family get-a-way with a wonderful opportunity to have great quality family tme, relaxation and FUN! FUN!! FUN!! !